Money in the Garage: Dumpster diving in the dark. Dumpster diving in the dark. Here is a true life story of “dumpster diving”. A few winters back I took note of a very old house being torn down near where I live. Situated in front of the house was a large steel dumpster. Deciding to investigate further, I peeked into the dumpster and noted not only construction material, but some personal belongings too! Unfortunately, it was broad daylight with lots of prying neighbors around, so I fought the primal urge to throw myself over the top. I decided I would investigate later under the cover of darkness. That night I bundled up, grabbed a flashlight and headed back down to the dumpster to explore further. Once I arrived at my destination, I climbed up on the dumpster and saw that amongst the old wood and refuse there were a bunch of old dress shirts. They were still folded and pinned, some even wrapped in their original cellophane! From the style I guessed they were vintage Sixties era. It was cold and freezing outside, so I quickly tucked the shirts under my arm and made my way back home. I hoped my leap into the dumpster was worth the effort! It's hard to gauge what a vintage shirt will sell for on eBay. There are gazillions listed at any given time. But a good way to attract buyers is to give them a bunch to bid on. So I posted all five shirts on eBay in one big grouping. 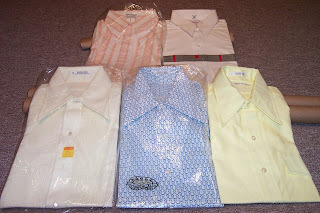 I hoped an auction for five vintage shirts would fire up the many eBay fashionistas out there! Sure enough, my dumpster dive paid off...they sold for $30. Not huge, but found money as far as I was concerned! Interestingly, a West Point cadet bought them. I guess he wanted to look sharp when he went casual. Not bad for a quick dumpster dive in the dark ! You're so crazy Rose !